However, today’s paper led by Emma Yu argues that those measurements were not interpreted properly since they did not take into account the relatively rapid rate CO depletes over time (see Figure 1). This paper asks: What can we really learn about turbulence from CO spectral lines if we include CO depletion in our model? Figure 1. Density of CO and H2 at a range of distances from the star over time (taken from chemical models). Previous measurements of turbulence assumed the ratio of CO-to-H2 to be constant over time, but this is not true beyond 15 AU after 1 Myr. Adapted from Fig. 1 of the paper. Background: Why do protoplanetary disks accrete onto their stars? 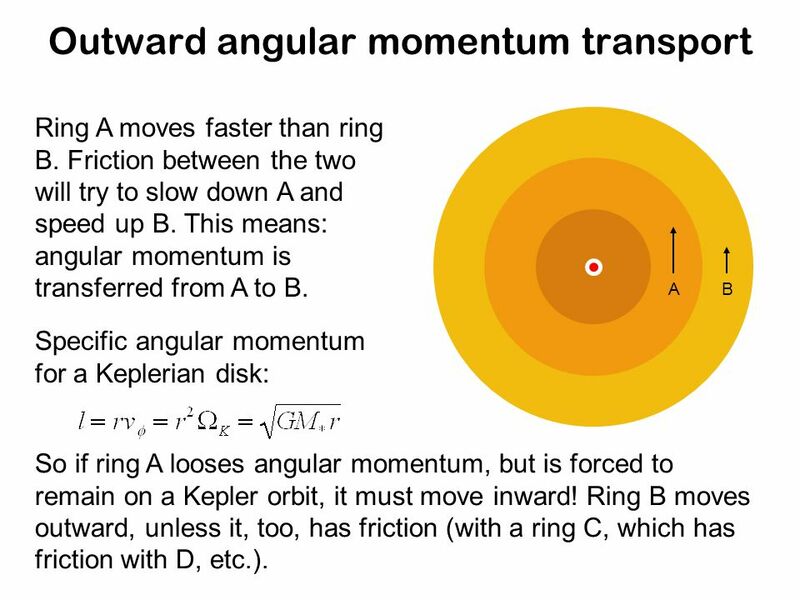 It is understood that disks must accrete by transporting angular momentum outwards. Naively, we might expect this to happen through “viscous shear flow.” In this process, the gaseous disk struggles to behave like a fluid because it rotates at a slower rate further away from the star (due to Kepler’s 3rd law). As a result, material in the outer disk will try to speed up to catch up to the inner disk – thereby increasing its angular momentum. Meanwhile to compensate for that increase (and conserve angular momentum), the material in the inner disk will slow down. Since this gas is rotating too slowly to obey Kepler’s 3rd law, it will spiral inwards and eventually accrete. There is just one problem: disks are too sparse to interact viscously like a fluid! For shear flow to occur, there must be some source of turbulence to make the disk viscous. 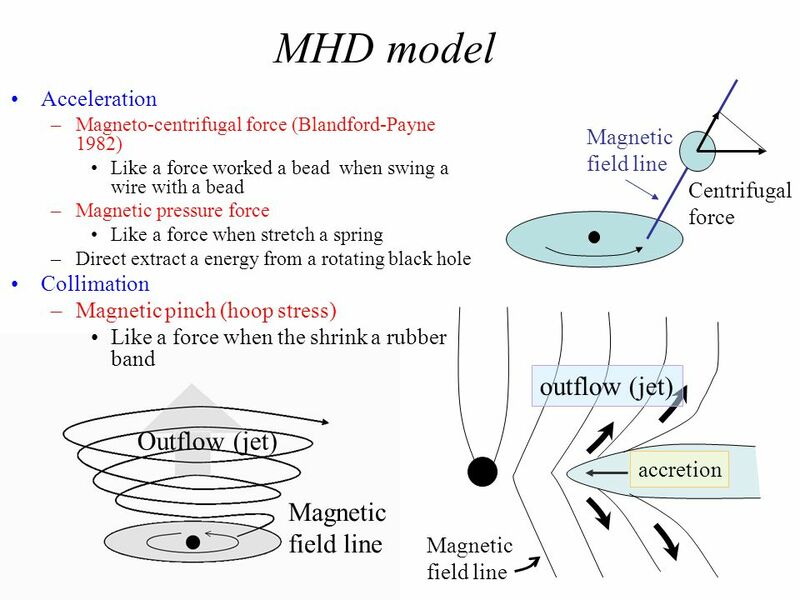 It is widely accepted that magnetic fields can create turbulence by triggering an instability, but it is not clear if this instability actually occurs in the entire disk. If it does not occur in most of the disk, turbulence most likely would not be responsible for making the disk accrete. 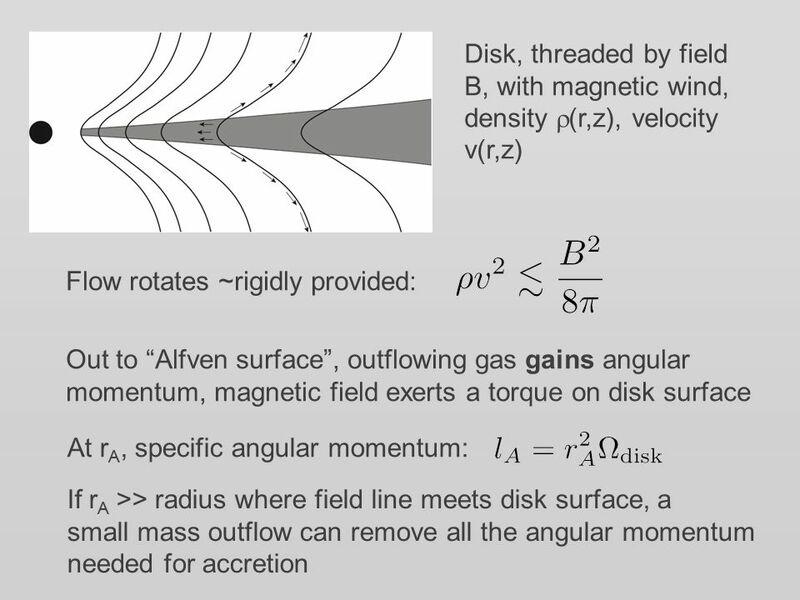 Instead, magnetic winds – which transport angular momentum outward in a completely different way by flinging material out of the disk on magnetic field lines pointed away from the star while the disk rotates (see also here and here for more) – would be the favored reason for the disk accreting. We would know why protoplanetary disks accrete if we could just measure their levels of turbulence, but we did not have the telescope power to do this until the ALMA telescope array was turned on several years ago. In this astrobite, Tim discussed a new method for measuring turbulence with ALMA by looking at the shape of a specific CO spectral line. Spectral lines are one of the most important tools in astronomy. They are used for everything from inferring compositions of atmospheres to measuring distances to distant galaxies, among many other things. Molecules (and atoms) emit spectral lines when electrons that were excited to a high energy state transition back to a lower energy state***. While these lines are emitted at the precise wavelength corresponding to a transition, they never appear perfectly thin. They always exhibit some level of “broadening” due to the gas molecules moving towards us or away from us as they emit. 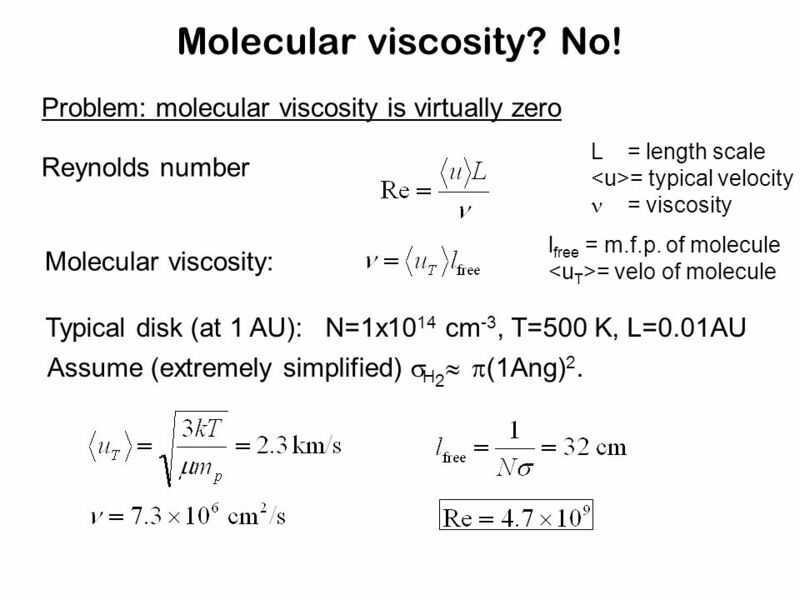 The velocities of individual molecules are mostly random. Thermal effects create most of the random motion for gas molecules. Besides that, turbulence also creates a little bit of random motion, causing spectral lines to broaden more than normal. As a result, we can use the broadened shapes of spectral lines (that are very well-resolved) to measure turbulence! The paper covered in Tim’s astrobite found that turbulence can be probed by measuring the CO spectral line’s peak-to-trough ratio (see Figure 2). Specifically, disks that are less turbulent have higher peak-to-trough ratios. However, this analysis assumed that the amount of CO in the disk relative to hydrogen is fixed over time, whereas chemical models predict it should actually drop significantly in older disks (see Figure 1). Figure 2. CO spectral line profiles with different levels of turbulence, with lower levels producing a higher peak-to-trough ratio. (Note: The double-peak structure arises from part of the disk rotating towards us and part of the disk rotating away from us.) Adapted from Fig. 4 of the paper. Coincidentally, Emma Yu et al. 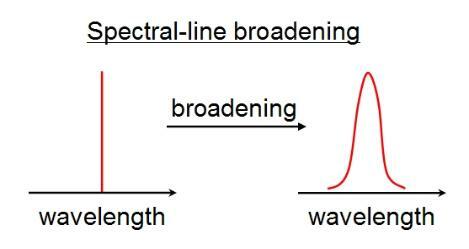 find that the depletion of CO also creates spectral lines with higher peak-to-trough ratios (see Figure 3). As a result, the authors of the other study may have thought that they detected low levels of turbulence by measuring a high peak-to-trough ratio when they may really only be seeing evidence that CO has been depleted! Figure 3. CO spectral line profiles at different stages in the disk lifetime. Left: Includes CO depletion. Right: Assumes constant CO-to-H2 ratio. With a constant CO ratio, the peak-to-trough ratio does not change after 1 Myr. 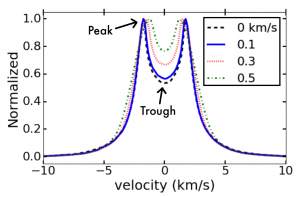 With CO depletion, the peak-to-trough ratio increases over time just like with decreasing levels of turbulence. Adapted from Fig. 2 of the paper. Figures 2 and 3 (and also Figure 7 of the paper) show how easy it is to confuse a disk with no turbulence at all with a disk that has a moderate level of turbulence. If that extra turbulence is present, it might be strong enough to explain the observed levels of accretion in the previous study, giving favor to the long-assumed idea that turbulence drives accretion – not magnetic winds. However, the paper shows that our current measurements may not be able to distinguish these levels of turbulence, leaving the question of why disks accrete still unsolved. All hope is not lost! 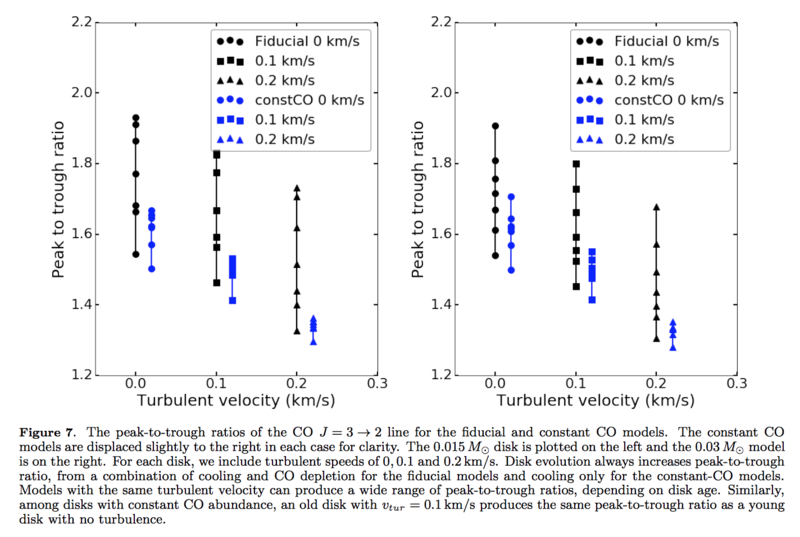 The authors point out that a different isotopologue of carbon monoxide (C18O) may be more useful for measuring turbulence. 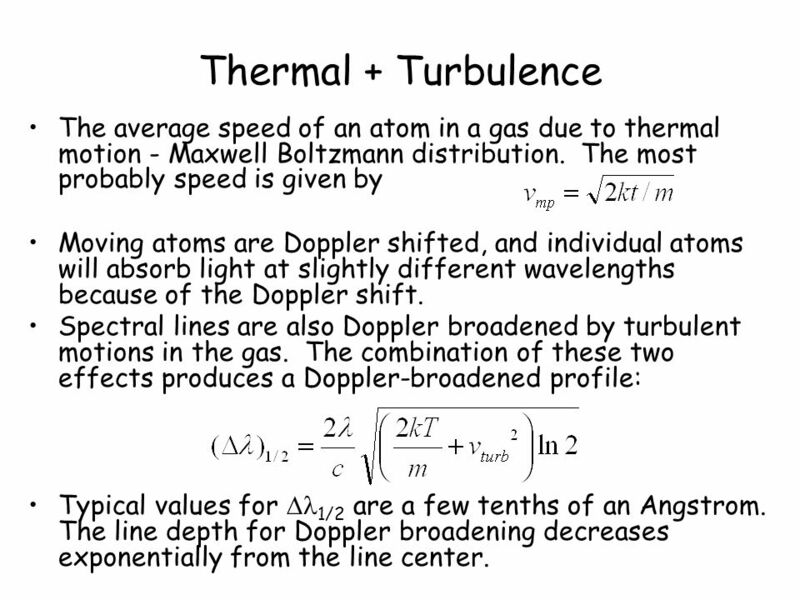 However, its spectral lines are weaker and thus, more difficult to resolve. They also point out that CO would be more helpful if we could also measure the precise level of CO depletion in a disk (rather than infer it from chemical models). This is an exciting time for studying protoplanetary disks because we are finally beginning to scratch the surface of measuring turbulence. Getting proper measurements though, will require more digging. Gas and Dust in a Protoplanetary Disk: Turning 2D Data into 3D Models Sneak a peek on the cause of death of protoplanetary disks Giant planets from far out there Will the real Protoplanetary Disk Mass please stand up?